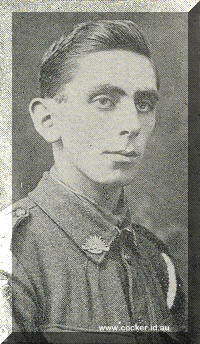 3- Samuel Hildreth Dobson was born on 3 Oct 1873 in Exton, Tasmania and died on 5 Aug 1950 at age 76. Samuel married Emma Amelia Cope, daughter of George Cope and Adelaide Jordan, on 18 Nov 1895 in Ulverstone, Tasmania. 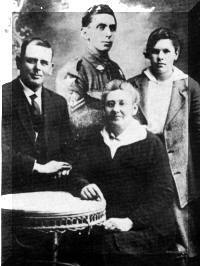 Emma was born on 13 May 1874 in Deloraine, Tasmania and died on 18 Nov 1931 at age 57. She is a descendant of Norfolk Island convicts James Jordan and Mary Butler. Samuel Hildreth Dobson married Emma Cope of Elizabeth Town on 18th November, 1895. They lived at first in a cottage on the Deloraine side of Forest Hall on the main road at Elizabeth Town. The chimneys are still standing near the brow of the hill, and can be seen from the road. Later on they moved to the Pineroad property where Hildreth lost an arm in a shooting accident, when his gun accidentally discharged while getting through a fence. Their son Morton was killed in action July 1918, one month before the cessation of hostilities, in his 21st year, serving with the 26th Battalion. Hildreth engaged in general farming. As frequently as possible, visits were made to other members of the family who had by now moved to other districts. Emma received a wound to her leg when she was spurred by a rooster. This lead to blood-poisoning which resulted in her death in the Ulverstone Hospital on the 18th July, 1931. Hildreth passed away in his 77th year on the 5th August, 1950 at the home of his daughter Doris (Counsel), "The Gables", Pineroad. 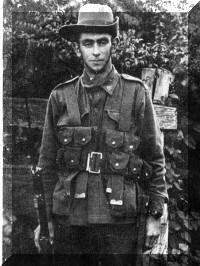 In 1938, at the age of sixteen, Neil Dobson enlisted in the 22nd Light Horse Regiment. About 10 members came from Riana from where they rode their horses, one Saturday each month, the 32 miles return between Riana and Ulverstone. This routine necessitated leaving home at 6.00 a.m. returning between 10.00 p.m. and midnight. An annual 14 day camp at Mona Vale gave the men the princely sum, in those days, of eight shillings per day plus four "bob" for the horse. This 127- per day was considered good money. "Chap" (Russell) Dobson who was his senior in age was his minder and guardian in camp. In the infamous 1940 stampede of 500 horses was a never to be forgotten incident. Twenty-eight horses were killed or destroyed by the end of the day. 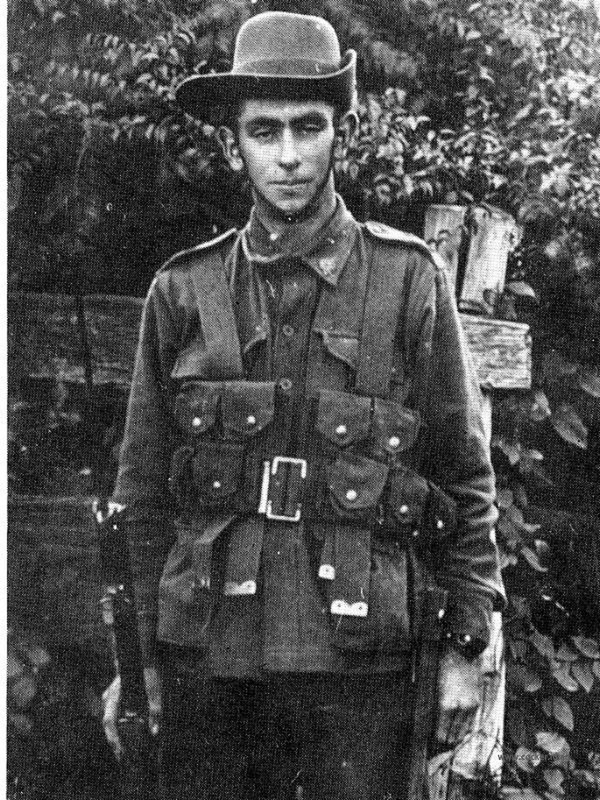 In 1941 Neil enlisted in the Army TX7856 and was transferred to a mechanised unit from where he attended Rosanna School of Armour and Mechanised Warfare and qualified as a Corporal Instructor. With the Japanese intervention in 1941, a changing pattern of warfare in the Pacific area led to the disbanding of this unit. 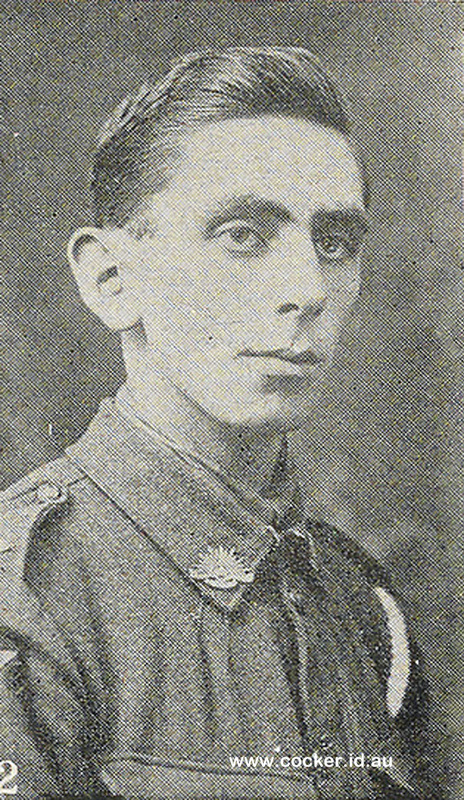 4-Morton Wilfred Dobson† was born on 20 Mar 1897 in Ulverstone, Tasmania, died in action serving in the First World War on 29 Aug 1918 in France at age 21, and was buried in Assevillers New British Cemetery, Assevillers, Picardie, France. 5-Neil Dobson was born on 21 Jan 1922 in Elizabeth Town, Tasmania, died on 17 May 2005 in Launceston at age 83, and was buried on 20 May 2005 in Carr Villa Cemetery, Launceston, Tasmania. He served in the Second World War. Neil married Audrey Elliott on 28 Sep 1946. Audrey was born on 7 Mar 1921 in Tasmania and died on 14 Feb 2011 at age 89. They had two children: Stephen Neil and Jane. 6-Stephen Neil Dobson was born on 3 Oct 1961. Stephen married Wendy Bantick. Wendy was born on 22 Mar 1962. They had three children: Thomas Stephen, John Maxwell and Larissa Maree. 7-Thomas Stephen Dobson was born on 24 Aug 1986. 7-John Maxwell Dobson was born on 2 Nov 1988. 7-Larissa Maree Dobson was christened on 31 Mar 1990. 6-Jane Dobson was born on 9 Apr 1965. Jane married Russell Knowles on 14 Oct 1986. They had three children: Mitchell Russell, Leighton Rhys and Austin. 7-Mitchell Russell Knowles was born on 29 Oct 1994. 7-Leighton Rhys Knowles was born on 14 Feb 1997. 7-Austin Knowles was born on 28 Mar 2000. Doris married Aloysious Gabriel Counsel. Aloysious was born on 24 Nov 1885 and died on 6 Jun 1964 at age 78. They had two children: Wyvernne Maree and Barbara Kaye. 5-Wyvernne Maree Counsel was born on 29 Mar 1937. Wyvernne married Terrance Goss. Terrance was born on 17 Dec 1937. They had two children: Catherine May and Michael John. 6-Catherine May Goss was born on 20 Jan 1963. 6-Michael John Goss was born on 18 Mar 1964. Michael married Julia Parsons. Julia was born about 1966. 5-Barbara Kaye Counsel was born on 14 Dec 1945. Barbara married Phillip Ray Edwards. Phillip was born on 28 Jan 1945. They had four children: Deborah Jane, Rachel Mae, Jodie Deanne and Benjamin Philip Ronald. 6-Deborah Jane Edwards was born on 5 Jul 1965. 6-Rachel Mae Edwards was born on 7 Feb 1968. 6-Jodie Deanne Edwards was born on 24 Jan 1970. 6-Benjamin Philip Ronald Edwards was born on 11 Jul 1974. Doris had a relationship with Unknown. They had one son: Neil.